The largest city in the French West Indies, Fort de France is a cosmopolitan urban area of more than 100,000 people, with a distinctly French atmosphere. Narrow streets wind steeply up hills, framed by wrought-iron balconies, and from a distance the city seems to be half-made up of jungle, with plenty of gardens and verdant green spaces. A handful of historical and cultural sites make for a full day's worth of sightseeing in Fort de France, including historical buildings like Fort Saint-Louis, beautiful churches like the Sacré-Coeur de Balata and the Cathedral Saint-Louis, and the lovely Balata Gardens. There are also several beautiful waterfalls, including the Cascade Absalon and the Cascade Didier. While the nightlife in Fort de France isn't quite on a par with most large cities, there are some good restaurants and shopping opportunities in the city. Several markets offer local produce and spices, and Victor Hugo Road is a shopping street with souvenir shops and boutiques sandwiches between local fruit and flower sellers. 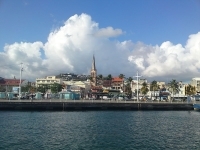 Most tourists in Martinique spend only a day or two in Fort de France, but the city makes a good place to stop over before taking the ferry to Trois Islets.